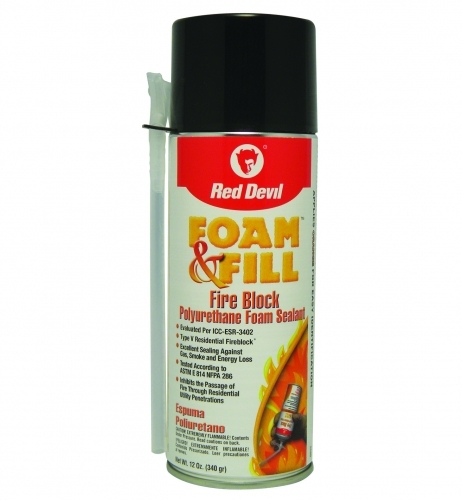 Fire Block is a ready to use polyurethane expanding foam for filling, insulating and sealing gaps, cracks and openings in buildings' interior and exterior. Red Devil® Window and Door Polyurethane Straw Foam Sealant is specifically formulated for filling, insulating and sealing around windows and doors. Foam & Fill® Large Gaps & Cracks Expanding Polyurethane Sealant, 12 fl. oz. Foam & Fill® Large Gaps & Cracks Expanding Polyurethane Sealant is quick and easy to use. It expands to fill holes, cracks, gaps and voids around windows, doors, pipes, outlets, vents and foundations.